Instability and insecurity persist in Western Sahel despite international interventions. Regional countries, and Mali in particular, must improve their governance to address problems on the long run. Despite international military interventions, Mali and the broader Western Sahel remain highly insecure and unstable. A complex network of armed groups including jihadi combatants and Tuareg insurgents continue to operate across the region. Mali and its neighbors in the region must undergo important reforms to improve their governance and address security issues on the long term. The Sahel region is one of the most unstable and dangerous regions in the world, with a myriad of armed militants frequently clashing with security forces and civilian populations. Security has greatly deteriorated in Western Sahel since the mid-2000s, reaching a climax in northern Mali in 2013. Regional and international powers sent troops to stop the military offensive carried out by a network of Tuareg (Berber tribes from Western Sahara) and jihadi groups, preventing violent radical Islamists from seizing power in Bamako. More than four years after the beginning of this international intervention, Mali and the broader Western Sahel region remain highly unstable and insecure. Steven Zyck and Rogert Muggah explain that this security disaster is the result of an accumulation of underdevelopment as well as humanitarian and governance crises in a region that has long been suffering from chronic malnutrition and food insecurity. The two regional experts add that regional instability created several “ungoverned spaces” in which terrorist groups have proliferated. Regional instability set the ground for the Malian security crisis, but it really is the downfall of Muammar Qaddafi in Libya that poured oil on fire. After the death of the Libyan dictator in 2011, several Tuareg factions which were fighting alongside Qaddafi in Libya came back to the desert with military equipment and increased combat experience. Most of them gathered behind the banner of the National Movement for the Liberation of Azawad (MNLA). Tuareg groups seek political autonomy in Mali’s northern regions while jihadi groups are following an Islamist agenda. 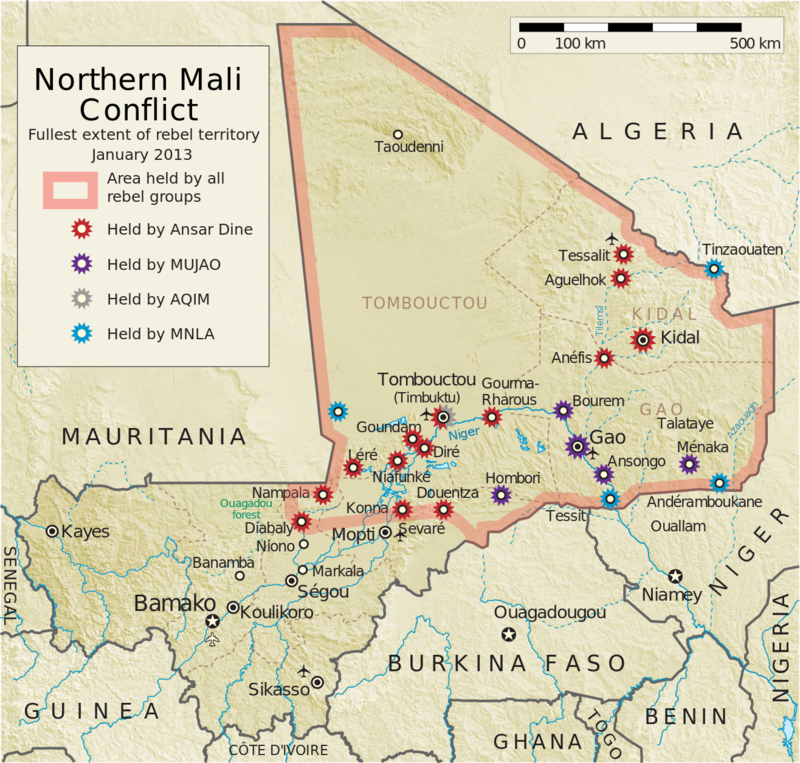 These different armed groups have maintained conflictual relations as a result, but are also capable of cooperating with each other at times in order to defeat Malian government forces. Al Qaeda in the Islamic Maghreb (AQIM): AQIM is the main jihadi group operating in Western Sahel. It was created in 2007 in Algeria, succeeding the Salafist Group for Preaching and Combat (GSPC). GSPC was itself the heir of the Armed Islamic Group (GIA), a jihadi organization which fought against the Algerian government during the Algerian civil war. After joining the Global Jihad movement, AQIM specialized in attacking western targets and their allies (governments receiving “western support” in Western Sahel). The fight against a common enemy (the Malian government) has pushed AQIM to cooperate with local Tuareg groups such as the MNLA, but the differences in their respective agendas (AQIM runs on a religious agenda under the Global Jihad movement while the MNLA seeks political autonomy in northern Mali) has given birth to a complicated and conflictual relationship. In 2012, AQIM’s top commanders, Mokhtar Belmokhtar, left the group to create Al-Mulathameen which became Al-Mourabitoun in 2013, after merging with splinter factions from the Movement for Unity and Jihad in West Africa (MUJAO). Belmokhtar and his successive splinter groups, kept ties with AQIM. Ansar al-Dine (Movement of the Defenders of the Faith): Ansar al-Dine joined the fight in Mali proclaiming itself a defender of the Islamic world and seeking to spread Sharia law in the region. Founded by Tuareg rebel Iyad Ag Ghaly, the group also includes Arabs and members of regional ethnic minorities who have clashed with MNLA. Macina Liberation Movement (FLM): FLM is a group affiliated with Ansar al-Dine that came to prominence in 2015 after a series of attacks in southern and central Mali. It is led by Amadou Kouffa who managed to rally several people from central and north Mali after the government and ruling elites failed to protect them and address local grievances in these regions. 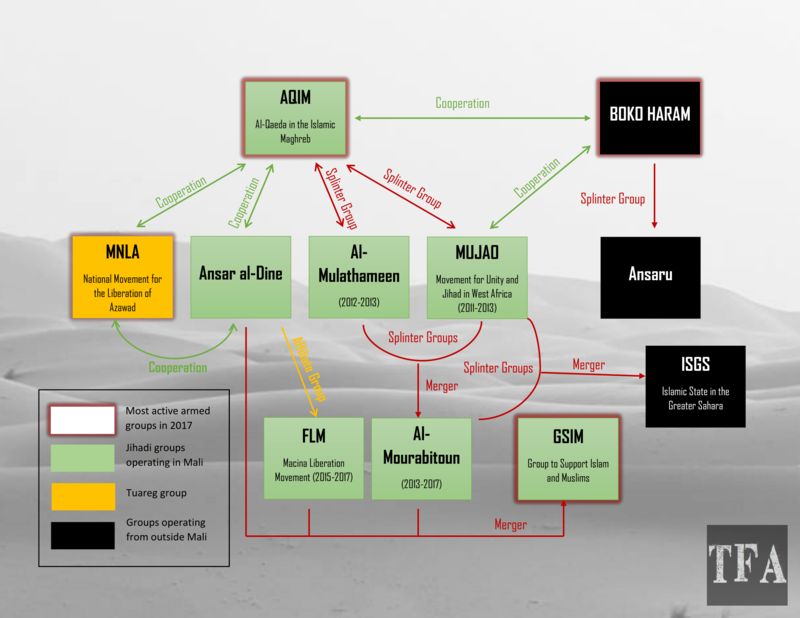 Group to Support Islam and Muslims (GSIM) or Jama’a Nusrat ul-Islam wa al-Muslimin’ (JNIM): In 2017, reports indicated that splinter factions from FLM, Ansar al-Dine and Al-Mourabitoun merged to create GSIM, under the leadership of Iyad Ag Ghaly. This move, intended to gather regional jihadi groups in order to fight Malian and international security forces, has been praised by AQIM. National Movement for the Liberation of Azawad (MNLA): MNLA is the main Tuareg group operating in the region. Although it was built following a secular political line, the MNLA sided periodically with Islamist groups since 2012 to fight against Malian government forces and take control of northern Mali. In October 2014, MNLA announced the creation of the Coordination of the Azawad Movements (CMA), alongside smaller regional Tuareg movements. 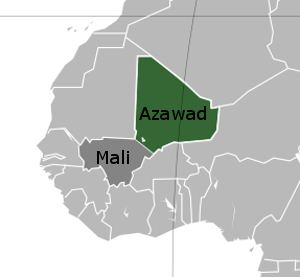 The coalition now includes the High Council for Unity of Azawad (HCUA), and the Arab Movement of Azawad (MAA), and is currently chaired by Bilal Ag Acherif. Islamic State in the Greater Sahara (ISGS): Also known as the Islamic State of the Sahel, ISGS was created in 2015 as an IS-affiliate by Adnan al-Sahrawi. Sahrawi is a former spokesman of MUJAO and Al-Mourabitoun who pledged allegiance to IS’s self-proclaimed caliph Abu Bakr al-Baghdadi, and subsequently became the representative of the terrorist group in Western Sahel. Although ISGS was formerly based in Mali, it is suspected to be now operating outside of the country. Boko Haram: Boko Haram is a jihadi group created in 2002 by Salafi preacher Mohamed Yusuf. The group originated in Nigeria and quickly became the deadliest terrorist group in Western Africa. After Yusuf’s death in 2009, Abubakar Shekau took the leadership of the group and started forming alliances with other actors of the Global Jihad movement such as Al-Qaeda. In 2015, the jihadi group pledged allegiance to IS and officially became the Islamic State in West Africa (ISWA), but remained commonly referred to as Boko Haram. A notable splinter faction of Boko Haram is Ansaru, which has notably been carrying out attacks against Nigerian military forces helping the Malian government, highlighting the transnational dynamics of the conflict. Boko Haram is also suspected of having important ties with jihadi groups operating in Mali up until today. Armed groups, and jihadi ones in particular, also have confirmed and suspected ties with a wide range of other armed groups across Africa and the world. The regional picture drawn above is meant to provide a general understanding of the national and transnational dynamics of the armed struggle taking place in Mali and in Western Sahel more broadly. Criminal activities have proven a key fundraiser for these armed groups to survive and finance their activities. As a result, the Sahel region has emerged as a major hub for the trafficking of drugs, arms, people and other contraband which have notably been exported to Europe. The increasing intersections between terrorist groups and organized crime in the “ungoverned spaces” of Western Sahel, has added an additional component to the region’s insecurity. Mali is home to various ethnic groups with different societal, cultural and historical heritages. Since achieving independence from its former French colonial power in 1960 (and even more so in the past decade), none of the political leaders in Bamako have been able (or perhaps willing) to undertake the structural reforms necessary to address the concerns, grievances and claims of the country’s ethnic minorities and, in particular, those of the Tuareg groups. Luca Raineri and Francesco Strazzari, from the European Union Institute for Security Studies (EUISS), explain that Mali has historically relied on local elites, mostly from the Fulani ethnic group to control the country’s northern regions. As a result, Bamako always kept a limited influence on these outer regions and delegated power to a regional ruling class, hence creating important patronage relations between those ruling and the common people in northern Mali. The fragile balance of these relations collapsed in 2012 after the Tuareg rebellion and the failure of local elites to protect their people. Many among the outcasts (those who are not part of the ruling cast) joined jihadi groups (MUJAO in particular) to seek protection, fight Tuareg militias and overthrow corrupted ruling elites. The French military intervention allowed for the reestablishment of the Malian government’s authority over the country’s outer regions in 2013, but it also paved the way for a new beginning of the patronage relationship between the ruling elites and the outcasts. Tensions rose to the point of pushing local shepherds into organizing self-defense militias and conducting a series of attacks targeting Fulani elites. Cleavages and grievances were further exploited by jihadi groups and led to new insurgencies against the Malian government and the international military forces operating in the region. In this context, for instance, the FLM became an important challenge to overcome for security forces engaged in Mali. Its ties with Ansar al-Dine highlight the connectivity between regional jihadi groups, along with their ability to capitalize on Bamako’s poor governance. Unable to maintain its authority in the outer regions while facing an invasion in the south by Islamist combatants, the Malian government had no other alternatives but to call for international assistance in January 2013 to stop the advance of armed insurgents and restore its control over Mali. 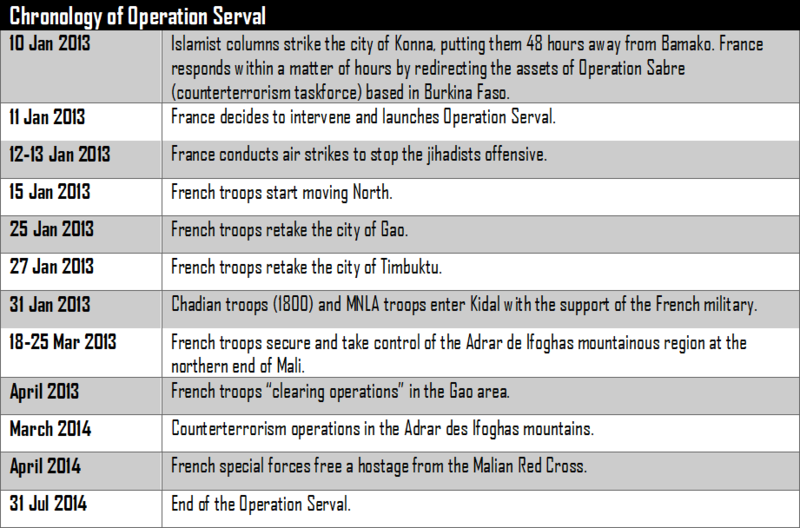 France answered within a matter of hours, launching Operation Serval. The Operation revolved around three goals: 1) help Malian security forces stop terrorist groups’ advance and protect civilian populations; 2) help Mali recover its integrity and territorial sovereignty; 3) facilitate the implementation of international security operations (the United Nations Multidimensional Integrated Stabilization Mission in Mali – MINUSMA, and the European Union Multinational Military Training Mission – EUTM Mali). From a tactical standpoint, France deployed high mobility troops and vehicles assisted by special operation forces, to “get [the job] done as fast as possible.” The goal was to destroy the Islamist forces before they had time to flee the country or reorganize. The designated targets of the Operation Serval were jihadi groups, and France collaborated with local Tuareg groups, including MNLA, to fight Islamist combatants. Tuaregs played an important role as guides, scouts and interpreters for the French military but more importantly, this alliance gave the military task-force additional regional legitimacy as it pictured France as cooperating with all non-jihadi parties and not only with the central government. It is also worth mentioning that despite France’s leadership in the military intervention, a number of its international partners (principally Canada, the US, the UK, Belgium, Denmark and Germany) provided significant logistical support. Following the end of Operation Serval France launched Operation Barkhane on 1 August 2014. This military operation is a direct continuation of Operation Serval and its goals include the support of MINUSMA, EUTM Mali as well as the armed forces of regional countries in their mission to secure Western Sahel. 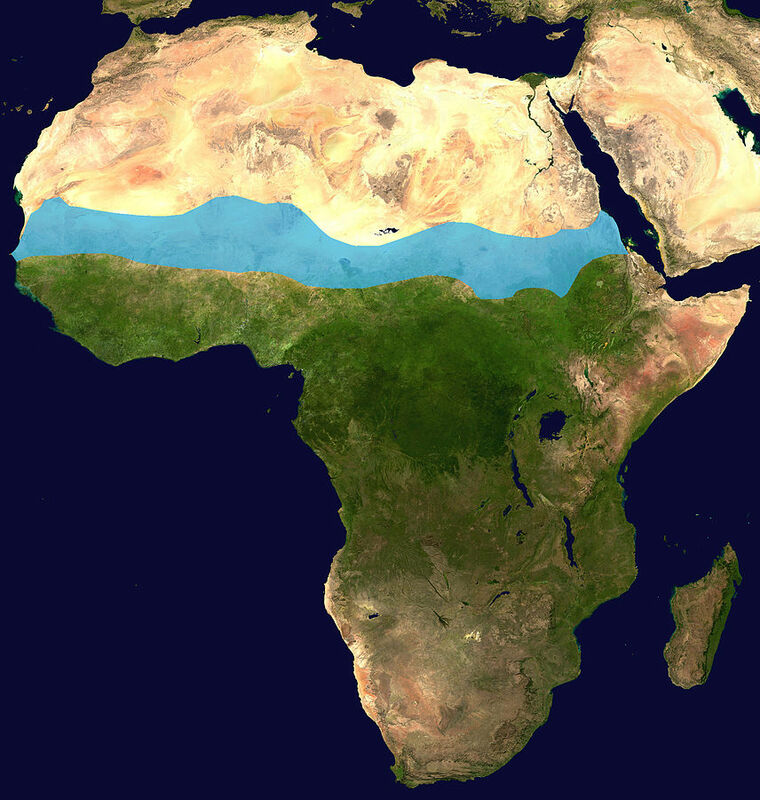 Its primary mission, however, is to assist the G5 Sahel (G5S) security alliance. G5S gathers Burkina Faso, Chad, Mali, Mauritania, and Niger, and aims to strengthen cooperation on development and security in the Sahel region. To face terrorist groups operating in the region, G5S has recruited 5,000 military, police and civilian personnel. The alliance was approved by the African Union Peace and Security Council in April 2017. G5S is now the main body in charge of fighting terrorism and transnational organized crime in the region, and has been granted an estimated $500 million for its first year of operation, financed by both regional countries and members of the international community. To counter asymmetric attacks in active defense (use of limited offensive actions for a defensive purpose). These are all ambitious goals, but the reality seems less positive. Jane Hahn from The Washington Post published a long report on MINUSMA, calling it “the world’s most dangerous U.N. mission.” She explains that “the United Nations was remarkably unprepared for the threat” in Western Sahel and provided insufficient military equipment to its personnel to face terrorist groups engaged in the region. Hundreds of personnel from MINUSMA have lost their lives as a result since the beginning of the mission. Moreover, the UN peacekeeping mission faces a significant structural challenge: the lack of counterterrorism capabilities. Indeed, the UN mandate is to protect civilian populations, not to pursue one group’s military defeat. From this perspective, MINUSMA soldiers appear more as opportunistic targets (as a symbol of “crusader occupation forces”) for jihadi groups, than a military taskforce capable of defeating terrorist groups. A number of additional international operations are also conducted in the region, including the EU Capacity-Building Mission (EUCAP), as well as the US-led Operation Enduring Freedom–Trans Sahara (OEF-TS) and Trans Sahara Counterterrorism Partnership (TSCTP). The regional and international military operations were supposed to restore peace and stability in Mali and in Western Sahel more broadly. The worst-case scenario was probably avoided as the Malian government was able to keep control of Bamako and preserve the country’s political institutions. However, while military forces focused on pushing armed groups out of the country and concentrated their efforts on the northern territories, Mali’s central regions (around the cities of Mopti and Ségou) started experiencing increased levels of violence and insecurity. There, tensions have crystallized around the conflict between Tuareg groups and Fulani communities, highlighting the inability of the Malian government and its international partners to enforce the Agreement on Peace and Reconciliation and restore stability across the country. International military operations can provide short-term security guarantees in targeted areas, but will be insufficient to fully secure and stabilize a region as vast as Western Sahel. For now, Mali and its neighbors can rely on their international partners who are highly dependent on their natural resources (France imports a significant portion of the uranium necessary for its nuclear industry from Niger, for instance), and have a strong interest in keeping the region stable. However, in a world where rising nationalisms increasingly challenges international cooperation, future perspectives are more uncertain. Jihadi groups will not hesitate to continue playing on inter and intra-ethnic tensions to recruit fighters and spread their religious agenda throughout the region. If local political leaders do not improve their governance quickly and significantly, Western Sahel will most likely remain one of the world’s hotspots in terms of instability and insecurity. Should Governments Take Away Foreign Fighters’ Citizenships? Is Iran Winning the Proxy War in Yemen?